I was making clouds of paint dust while sanding the cabin and topsides of my 1962 Sailmaster this winter to prep for spring painting when I began to long for the fragrance of wood dust. Fortunately, Joe Reid’s Mast & Mallet Boatworks is in the Mayo/Edgewater neighborhood of Casa Rio Marina, where my boat is hauled, so I detoured there to have a look.My last visit was 10 years ago, when Reid built a custom mahogany hatch for me to replace a dull fiberglass lazarette lid over my outboard well. Every winter I’m reminded of him when I bring home that showpiece and have the pleasure of sanding and varnishing it over the winter. 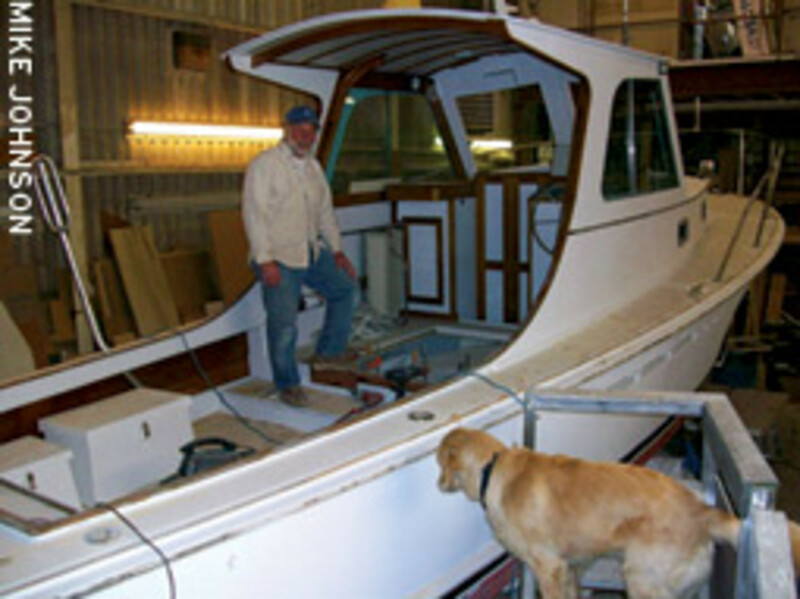 I found Reid, along with single employee Kitty Seaborn, at work sanding a Thomas Point 30 built in 2001 for Mike Cassady of Arlington, Va. “My work today remains maintenance and wooden boat repairs,” he says. 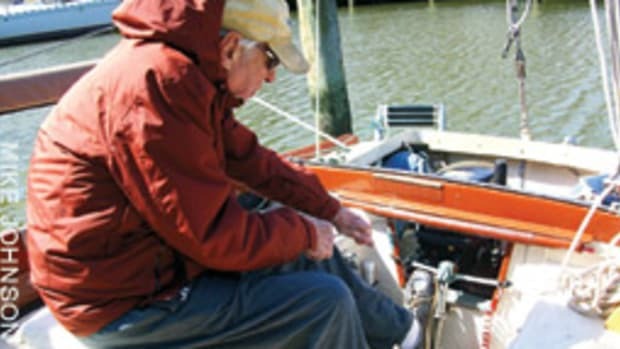 “We have regulars who come seasonally for paint work and varnishing, and also keep busy maintaining some wood classics.” Ironically, he was replacing the varnished toe rails on this boat with no-maintenance PVC. Also stabled in his rental facility at Holiday Point Marina on Selby Bay is a 1988 Cape Dory 28 cabin cruiser in for refinishing. 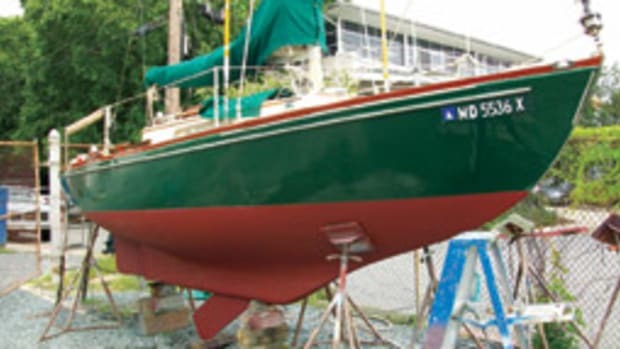 This particular boat was purchased at a bargain price by an owner for the purpose of flipping it over on the used boat market as a restored yacht. I had come to watch the master carpenter (www.mastandmallet.com) cut wood and fit planks and frames, not for a Hand Sanding 101 lesson. I mastered that art long ago, and even today I sand the tips of my fingernails during winter boatwork at home. 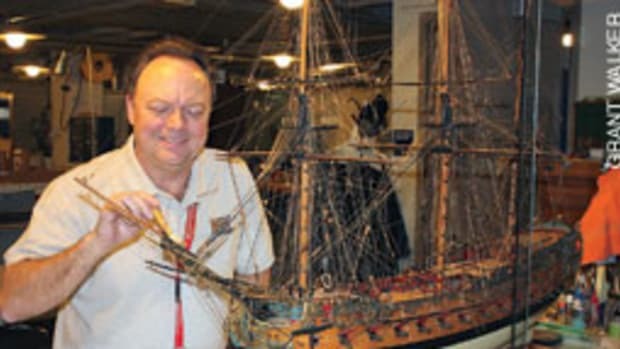 Reid looks very much the part of a Down East boatbuilder, with a full beard now gray at the age of 57 and a yellow pencil at the ready parked above his ear. 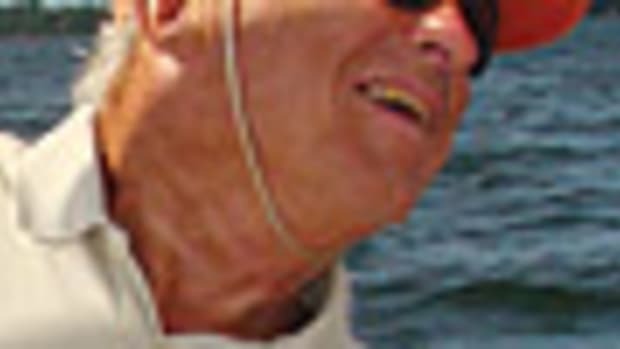 He is the kind of person who wears a natural smile as he speaks, and I can’t imagine him ever losing his temper, although that is a common occurrence in a boatbuilding environment. 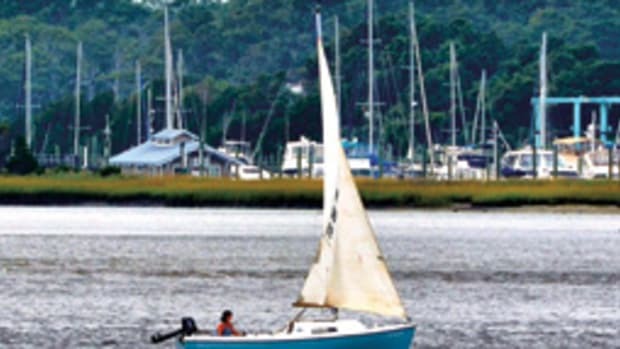 In some cases, owners have supplied the fiberglass hull and Reid did the rest. One was a Carman 32, and another was a 38-foot Wesmac. The interiors were laid out by Annapolis naval architect Mike Kaufman, Reid’s chosen designer for the Thomas Point series, which ranges in size from 30 to 44 feet.